The Mr?ida?ga? 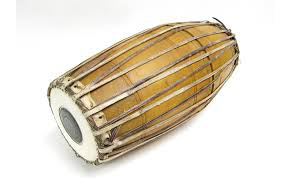 is a percussion instrument from India of ancient origin. It is the primary rhythmic accompaniment in a Carnatic music and Newa music ensemble. Alternate spellings include "mrudangam", "mrdangam", "mritangam" and "miruthangam in Tamil".